3herosoft DVD to Pocket PC Ripper enables you to convert DVD to Pocket PC video WMV format easily and fast, with perfect output quality. It supports Dell Axim, Palm, Portable Media Center, Windows Mobile device, etc. 3herosoft DVD to Pocket PC Ripper is professional DVD to Pocket PC Converter, which can help you convert DVD to Pocket PC video WMV format with perfect output quality. It supports PDA, Palm, Portable Media Center, Windows Mobile device, etc. With other similar software, 3herosoft DVD to Pocket PC Ripper has many additional features as follows: 1.Easily convert DVDs to your Pocket PC and convert DVD to Pocket PC video format WMV for enjoying DVD on your Pocket PC. 2.Convert DVD to Pocket PC audio; extract audio MP3 and WMA from DVD movie to Pocket PC. 3.Convert two or more files to Pocket PC in batch mode with only one click. 4.High DVD ripping speed provided as it fully supports multi-core CPU that ensures the most use of your CPU. 5.Retrieve DVD disc info automatically from Internet such as director, actors/actresses, release date, film name, studio. 6.Rip entire DVD movie, or one or several titles/chapters, just a part of one file with selectable subtitle and audio. 7.Provide specific video and audio parameters to customize you own video: resolution, bit rate, frame rate, codec, quality. 8.Get more than one WMV files for different source files with one click by adding multiple profiles or cloning DVD title. 9.Automatically split the output file into several WMV files with suitable split time or split length you prefer. 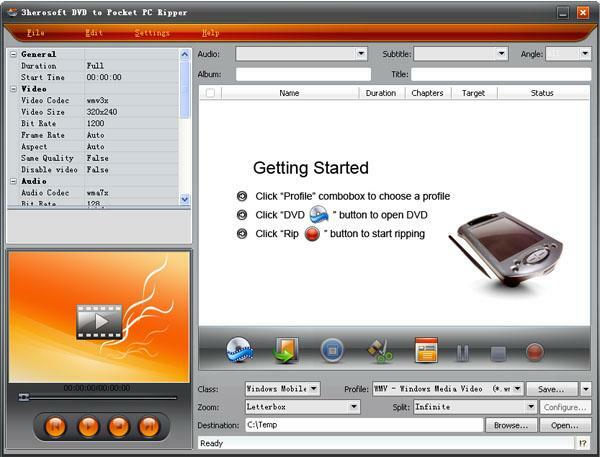 10.The DVD to Pocket PC ripper can be run in the background to finish the conversion and consume less resource. This site does not contain serial number, crack, keygen 3herosoft DVD to Pocket PC Ripper serial number : serial number is the simplest type of crack. A serial number(cdkey,product key,etc) is register the program as you may already know. a crack or keygen may contain harmful software. If you cannot find the exact version you want, just give it a try. for more information read .nfo/.txt/.diz file include in zipped file.